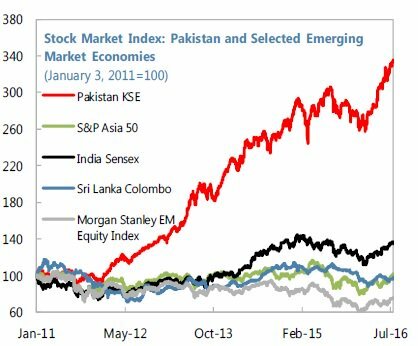 To add insult to injury, the investment flow maintained Pakistan market as the best performer in the region with KSE-100 outperforming all regional and emerging market indices over the last 5 years. As of Sept 30, 2016, KSE100 index, the PSX's key stock index, has gained almost 24 percent year to date making Pakistan the best performing market in Asia. Vietnam and Indonesia follow with returns of 18% and 16.8%, respectively, while India’s Sensex Index has gained only 6.7%. Year-to-date, the Global X MSCI Pakistan ETF (PAK) has gained 21.7%, according to Barron's Asia. Pakistan's shares are still selling at a big discount in terms of average price-earnings ratio of just 9.7 while other major indices in emerging markets like India are trading at much higher PE ratios of 15 or more. A total of 576 companies are listed on the PSX, with an aggregate market cap of slightly higher than 8 trillion rupees (US$80 billion), according to Nikkei Asian Review. PSX market cap is just 28% of Pakistan's GDP of $280 billion. The Asian Development Bank (ADB) has recently raised Pakistan's economic growth forecast for fiscal year 2017 (from July 2016 to June 2017) from 4.8% to 5.2%. The Bank also sees brighter outlook for the the entire South Asian region. Pakistan's economic recovery is in full swing with double digit growth in multiple industries, including auto, pharma, chemicals, cement, fertilizers, minerals, etc. It is expected to pick up steam over the next several years with new investments on the back of China-Pakistan Economic Corridor related projects. Investors have brushed aside Indian Prime Minister Narendra Modi's threats against Pakistan to drive the shares index to a new record high. They have expressed strong confidence in Pakistan's economy to continue to perform well. Much before the BRICS heads of nations meet in Goa today, the western media had already begun writing about its live funeral, if not epitaph. Less than a decade into its existence, this economic grouping of newly industrialised countries--that account for about half of the world population and nearly a quarter of its combined GDP--seems to be losing its relevance other than being a feel-good club. At its eighth annual meeting in Goa, BRICS is making headlines in India, not for any economic cooperation and growth, but for geopolitics. If the seventh summit at Ufa in Russia last year was about the much celebrated BRICS Bank (New Development Bank) and contingent reserve arrangement, all that we hear about the eight summit in Goa is geopolitics: terrorism, military cooperation with Russia and isolation of Pakistan. And it's India that's mostly talking. India using SAARC for ridiculing Pakistan or even undermining its convening rights is the swat, BRICS is the sledgehammer. Instead of development planners and finance ministry bureaucrats, it's going to be an Ajit Doval show. At least that's what Indian media reports indicate. Apparently he and his officials will push for "a strongly worded counterterrorism statement and a declaration that will highlight isolating countries that provide shelter to terror groups and help in arming these groups". The summary of this statement is two words: isolate Pakistan. Is that what BRICS means to India? And how does it even matter? Will Russia and China, the only BRICS countries that are of consequence to the south Asian geopolitics, will ever do anything? Certainly not. Pakistan is China's strategic asset and Russia, a self-interested voluntary ally against American strategy of using India as its Asian pivot. Brazil and South Africa are so far away and don't even have enough money or political resources for themselves. Therefore, making BRICS a proxy opportunity to bash Pakistan is a little excessive. If India has been clever and strategic, it should have used it for strengthening the idea of BRICS, when the whole world is justifiably sceptical. Isolation of Pakistan should have been just the incidental message that India would have anyway conveyed by inviting BIMSTEK (Bay of Bengal Initiative for Multi-Sectoral Technical and Economic Cooperation), that Pakistan is not a part of. Showing off on the BRICS platform, at least for the time being, doesn't mean much because the global media have almost written it off with disappointing growth projections for Brazil, South Africa and Russia and competing interest by China. India could have done by less theatre and more substance. Repetition of lines to keep people in perpetual anticipation, national pride and false-hopes, not just in dealing with Pakistan, but also in improving their lives, seems to have become a habit. And it has started showing everywhere as a standard, Indira-era Indian imprint. Modi appears to have left BRICS leaders unimpressed. As the dust settles on the Goa summit, the government’s orchestration of using the BRICS platform to isolate Pakistan has failed. Moreover, Modi’s loud claim of success has turned out to be embarrassing for the country. Modi erred on three major counts. Firstly, he overplayed the terrorism issue. At almost every session, he single-mindedly pursued his Pakistan agenda, derailing BRICS’s own agenda in the process. Secondly, he made the mistake of treating the five-nation grouping of BRICS as a debating club like the UN, which it is not. Soft, smart diplomacy ceded space to overt, unilateral pursuit of Pakistan-centric agenda that was outside the brief of BRICS. Thirdly and most importantly, Modi not only failed to read the mind of the Chinese but also misread the mood of Russian president Vladimir Putin. The result was expected. The Goa Declaration did talk of the menace of terrorism stalking the world in general terms. It addressed the global concern over terrorism, the battle being fought over it in Syria and other West Asian countries. But it omitted mentioning Pakistan, the “mothership”, in any manner whatsoever. Syria got mentioned because Russia wanted it. Pakistan was omitted because China opposed it. In more than a 100 points of the declaration, 109 paragraphs to be precise, Modi failed to have Pakistan named either in the context of cross-border terrorism or as a state sponsoring terrorism to further his political heft. Even the LeT and JeM, designated as terrorist organisations by the UN, didn’t find mention in the teeth of Chinese opposition. Ironically, Islamic State in Iraq and Levant (ISIL) and Jabhat Al Nusra, also designated terrorist outfits like the LeT and JeM by the UN, figured in the declaration. That’s because Russia had its way and China acted in coordination with Russia. China came out all guns blazing in favour of Pakistan and played spoilsport at the summit and later in Beijing. In response to Modi’s “mothership of terrorism” remark, the spokesperson of the Chinese foreign ministry Hua Chunying bluntly told journalists in Beijing that China was opposed to linking “any country or religion" with terror. On the contrary, China asked the world to acknowledge Pakistan’s “great sacrifices” in combating terrorism. Xi at the meet snubbed India by talking about addressing “symptoms and root causes” of terrorism. That’s precisely the language Pakistan has been using in reference to Kashmir. Pakistan has plowed an independent trajectory this year, outperforming both its fellow frontier markets and members of the emerging-market grouping that it is slated to join in 2017. The country's benchmark KSE100 Index has rallied 27 percent year-to-date to become Asia’s best-performing equity market in 2016, according to a basket of 26 peers tracked by Bloomberg. The market received a boost in June when MSCI Inc. announced that it would reclassify Pakistan as part of its benchmark emerging-market index from May 2017 — a show of confidence that it declined to extend to China. It was a long time coming for South Asia's second-largest economy. The Pakistan Stock Exchange, previously known as the Karachi Stock Exchange, was downgraded to frontier-market status in 2009 after it introduced curbs against sell orders to stem an investor exodus in late 2008. After registering gains over seven of the eight years since, investors are betting it still has further to climb. "The benchmark index can easily reach 60,000 before the general election in 2018," said Vasseh Ahmed, who's chief investment officer of Karachi-based Faysal Asset Management Ltd., in an interview. That represents almost a 50-percent increase from present levels. "Now that the IMF program is over, the government will be giving incentives that will positively impact the market and business sentiment. The boost from the upgrade and Chinese investment is also there.". The KSE100 Index reached its all-time peak of 41,464.31 last Friday, and by 2:23 p.m. in Karachi was heading toward a new record. Last month Pakistan completed a three-year $6.6 billion International Monetary Fund loan program. Thanks to the aid, Prime Minister Nawaz Sharif was able to avert a balance-of-payments crisis and boost foreign-exchange reserves to a new high. "Textile is already seeing the push, and the government may further boost the agriculture sector. The banking sector will also rebound given interest rates have bottomed, while the oil and gas sectors are rallying following a recovery in energy prices and infrastructure development," added Ahmed. The country's central bank has held its benchmark interest rate at 5.75 percent since cutting by 25 basis points in May. For Federico Parenti, Milan-based fund manager of Base Sicav Emerging and Frontier Markets Equity Fund, Pakistan is on top of his wish-list. "My fund is currently waiting to get access to such a beautiful and nice market," Parenti said by e-mail. "At the moment Pakistan access is delayed due to fear of political and religious risks, but I think staying just in Europe for investment and thinking other places won't change for the better is a bigger risk." For Parenti, the improvements that are predicted by EFG Hermes to lure around $475 million of inflows by the middle of next year do, in themselves, carry risks. "Because of the MSCI upgrade, the ratio of foreigners holding onto Pakistani stocks is set to increase," the fund manager said. "But they will also add volatility since most of the money is 'disloyal,' meaning that they can easily pull their money out of the country whenever they want." Still, he said he plans to allocate 10 percent of his funds to Pakistan once regulators give the go-ahead, with these challenges failing to overwhelm to the country's enticing demographics. "The prospect is bright with the growing young population and the rising middle class. I want a piece of your economy — a piece of your frozen food, a piece of your cement, and a piece of your hospitals," he wrote. Asset management experts believe the findings will exacerbate investor concerns about overpriced, underperforming active funds, and will ultimately push investors into cheaper indexed and exchange traded funds. Stewart Aldcroft, senior adviser on the Asian fund industry at Cititrust, the fund services business of Citigroup, the US bank, said: “The S&P figures have become a massive boon for the ETF industry, which has been able to use them to show the benefit of passive investing. Last week politicians and consumer protection groups questioned the integrity of Europe’s €13.3tn asset management industry at an event specifically convened to look at the role of the asset management market. Attendees at the meeting, held at the European Parliament and organised by Sven Giegold, a Green MEP, accused investment houses of overcharging their clients and failing to put investors first. Mr Giegold, who co-organised the event with Sirpa Pietikäinen, an MEP from the European People’s party, said that “high costs” were hurting investment returns. Assets managed in passive mutual funds, which provide lower-cost exposure to markets by tracking an index, have grown four times faster than traditional active products since 2007, according to Morningstar, the data provider. Assets held in passive mutual funds have grown 230 per cent globally, to $6tn, since 2007. However, assets held in active funds total $24tn. But Russia-Indian relations came crashing down in 2016. Why? So why on Earth would Russia lose interest in its seemingly perfect, long-time ally? Why all of a sudden Russia has warmed up to Pakistan, its Cold War rival and the biggest historical enemy of India? Global relations are the answer. While many may argue, Russia has been very smart about global relations in terms of strategical and long-term planning. By having both Russia and China as its allies, Pakistan wins a lot. Islamabad had been friends with the U.S. and Saudi Arabia for years, but it now realized that neither Washington nor Riyadh really care about its interests. Pakistan now sees that the U.S. and Saudi Arabia have been sending all those funds in order to prevent the country from becoming an intimidating force in South Asia and becoming financially independent. Russia and China, meanwhile, are offering that independence as well as the prospect of becoming the most powerful country in the region (thus, signing military deals and holding military drills). It also adds to the fact that both America and Saudi Arabia have played a huge role in spreading sectarianism and terrorism in Pakistan. So naturally Islamabad has doubts about their good intentions. During the BRICS summit earlier this month, China protected Pakistan from India’s accusations. And by not standing up for India this time, Russia showed on whose side it’s on. A consortium of Chinese investment companies met Prime Minister Nawaz Sharif on Friday and announced to bring $3 billion in investment funds to Pakistan. Representatives of a consortium of Chinese investment companies comprising China Huarong International Holdings Limited, China Innovative Finance Group Limited, Hong Kong Tian Group, Chandong Hi-Speed Group and China Road & Bridge Group called on Prime Minister Nawaz Sharif at the PM House. Warmly welcoming the delegation, the prime minister appreciated the Chinese delegation’s fruitful interaction with ministries of Finance, Petroleum & Natural Resources, Water & Power and Capital Development Authority. The PM expressed hope that members of the Chinese delegation would have a productive visit in the backdrop of briefing by various ministries about immense potential for investment in Pakistan’s infrastructure development, energy and communication sectors. The prime minister expressed his gratitude to the leadership and brotherly people of the People’s Republic of China for their all-weather support that was getting stronger with each passing day. The CPEC was a game changer that was going to transform the lives of the billions of people of the region, the PM added. He said that the economic outlook of Pakistan has altogether changed in the last three years, which was being acknowledged globally. Standard & Poor’s (S&P) has also upgraded Pakistan’s ranking to B from B-; Pakistan is among this year’s global top 10 improvers in Doing Business 2017. Inflation was continuously on downward trend; reduction in petroleum prices also helped in decreasing inflation, further added the PM. The Foreign Exchange Reserves have now increased to over $ 24 billion, the prime minister apprised the delegation. Our Investment Policy has been designed to provide a comprehensive framework for creating a conducive business environment for the attraction of FDI, he said. Pakistan’s policy trends have been consistent, with liberalization, de-regulation, privatization, and facilitation being its foremost cornerstone, stated the prime minister. The Law of Special Economic Zones (SEZ) has been made to meet the global challenges of competitiveness to attract Foreign Director Investment (FDI). Members of the visiting delegation lauded the vision of the prime minister for economic revival and putting the country on development path. The members of the delegation said that Pakistan was fully ready as well as capable of absorbing and capitalising the Foreign Direct Investment. The delegation apprised the prime minister that they were bringing $ 3 billion investment fund to Pakistan because of the vision of the prime minister that focussed on infrastructure development and energy sectors. The Chinese delegation also expressed its intent to explore possibility of starting a new airline in Pakistan after the permission from the Government of Pakistan. The Chinese side said that it was actively pursuing its investments in infrastructure, power, aviation and tourism sectors of Pakistan. ‘We fully appreciate the vision of Prime Minister Nawaz Sharif which enunciates that economic prosperity is an offshoot of infrastructure connectivity and self sufficiency in the energy sector’, the members of the delegation stated. They said that the present government under the visionary leadership of Nawaz Sharif has done enormous work in infrastructure development and achieving energy self sufficiency. The present government has very liberal investment regime that offers an ideal and investor friendly environment for which the leadership role of Prime Minister Muhammad Nawaz Sharif is highly appreciated, said the members of the delegation. After years of flat direct foreign investment, it has taken China’s pledges of billions to get overseas companies to start looking beyond Pakistan’s negative headlines on security challenges and power outages. While investment into Pakistan has been little changed in the three years since Prime Minister Nawaz Sharif was elected, companies including Turkey home appliances maker Arcelik AS and Dutch dairy giant Royal FrieslandCampina NV are making acquisitions in Pakistan. Along with a military crackdown against militants following a 2014 school massacre and the government’s plans to end power shortages by 2018, it is China’s vote of confidence in the country that has boosted investor confidence. It pledged $46 billion in soft loans and investments in a so-called China-Pakistan Economic Corridor, or CPEC, announced last year. New power plant projects fueled by Chinese investment are expected to help with Pakistan’s chronic outages and pave the way for investment in other industries. Consumer companies are taking the lead to cater to the world’s sixth largest nation by population. “If you look at demographic and population, it’s just a great place to be,” said Naz Khan, Chief Financial Officer at Engro Corporation Ltd. whose food subsidiary is being bought by Dutch dairy company FrieslandCampina, which is looking to take a 51 percent stake in a deal valued at about $545 million at the Nov. 4 closing. Consumer spending in Pakistan has increased 83.4 percent in the past five years compared with 48.7 percent in the Asia-Pacific region, according to data by Euromonitor International, a consumer research firm. Its forecasts show Pakistan’s disposable income has more than doubled in six years. Arcelik is scheduled to complete its purchase of Pakistan’s home appliance maker Dawlance for $243.2 million this month. It plans to focus on the local market and closely evaluate opportunities in the current export markets of Dawlance, according to Sen.
Pakistan’s government expects the economy to grow at the fastest pace in a decade after completing an International Monetary Fund loan program that averted a balance of payment crisis and boosted foreign exchange reserves to a record level. The economy is expected to grow around five percent annually for the next three years and Arcelik plans to keep its sales growth above that, according to Sen.
Pakistan’s automobile sector has also attracted interest with Renault entering exclusive negotiations with Ghandhara and Al Futtaim to develop a brand in Pakistan, a spokeswoman said by phone on Nov. 3. Meanwhile, investments are expected to jump to $5 billion in the year starting July from $1.28 billion in the last fiscal year as power plants come on line, Miftah Ismail, chairman of the nation’s Board of Investment, said in an August interview. “I think you will also see Pakistan moving more toward merchant markets, you know people coming in and start taking risks," Khan said. “ I think this is just the beginning." The China-Pakistan Economic Corridor (CPEC) would help initiate a flurry of economic activity in Pakistan, said Tay Jui Seng, an official of the German Chemical giant - BASF. Talking to the media along with Faisal Akhtar, the head of BASF Pakistan, Seng said he would report back to his company as to how the BASF can participate in spurring the business activities in the Pakistani market. Tay Jui Seng, who is the Business Management Transportation Performance Materials Vice President for Asia Pacific, is based at BASF's manufacturing facility in Shanghai. He undertook a three-day visit to assess the market as well as the opportunities available in Pakistan. Seng pointed out that the BASF has research facilities based in many countries of the world and has been coming up with innovative products from time to time through research and development (R&D). BASF was in a position to provide quick solutions to the requirements of the businesses in Pakistan, which is an emerging market, he added. He stressed that Pakistan can also benefit a lot from its human resource especially by imparting right type of education and training to productive use of their talent, energy and potential. Seng also indicated that the BASF regularly trains their people from time to time to enhance their technical skills and know-how to serve customers more efficiently. He said that his company could also consider as to how it can participate in the CPEC activities through the supply chain mode. Seng also referred to the impressive growth of the automotive industry in Pakistan and especially in the two-wheelers market. He hinted that cooperation may also be extended by the BASF for the construction industry as well as in chemicals and polymers and also address the quick solutions that are required towards the growth phenomenon in Pakistan. Faisal Akhtar on the occasion said that Tay Jui Seng's visit augurs well and indicates towards the company's interest for further collaboration in the growth process in Pakistan where the business environment is now quite conducive. It may be pointed out that the BASF Chemicals and Polymers Pakistan Limited has changed its name to BASF Pakistan (Private) Limited effective from November 1, 2016. A communication said that the management under its new name assures all its customers of the same continuous commitment to support businesses with products and services. As the first Chinese truck containers entered a Pakistani dry port in the north last week and the first major size vessel last month docked at the Gwadar port, the ending point of the China-Pakistan Economic Corridor (CPEC), CPEC, a multi-billion-US dollar project, has become a visible "game changer" for Pakistan and the entire region. With an improved security situation in the south Asian country, Pakistan's macroeconomy has been stabilizing and enjoying momentum over the past years. Recently, the country has been upgraded to an emerging economy from a frontier economy on the Morgan Stanley MSCI index. "The CPEC itself for Pakistan could at least offer a significant opportunity for the country to address its supply side constraints such as weak foreign capital inflow," said Bilal Khan, senior economist at Standard Chartered Bank (Pakistan) Ltd., adding that against the backdrop of rebounding oil prices in the near future, which means Pakistan's oil import bills will swell, the CPEC will attract foreign direct investment from both private and public sectors to help keep a balanced current account in Pakistan. Due to the enhanced infrastructure such as roads and railways brought by the CPEC, "we forecast that the gross domestic product (GDP) growth should increase from around 4.7 percent last year to around 6 percent by 2019, and stay around the same level for 2020," the economist told Xinhua in a recent interview in Karachi, the financial center of Pakistan. With such a robust economic outlook, many foreign companies that have already been investing here for years are tending to re-invest in the country by seeking more opportunities under the CPEC, according to Pakistan's Overseas Investors Chamber of Commerce and Industry (OICCI). Abdul Aleem, chief executive and secretary general of the OICCI, told Xinhua that members of the chamber, who economically contributed to about 18 percent of GDP and some 33 percent of total tax collected in Pakistan, have seen the potentials in the market here and they re-invested about half of their profit in Pakistan rather than taking their money back. He said that his members and many local companies are eager to talk with Chinese companies that have projects under the CPEC so that they could make clear exactly what the opportunities are and how to access them. As a member of the OICCI, the Standard Chartered Bank (Pakistan) Ltd. believes that the CPEC is a unique opportunity for it to play a "pivotal role" in ensuring that the bank could help make the huge project a real success in the south Asian country, according to the chief executive officer (CEO) of the bank. He said that the bank is also promoting the internationalization of the Chinese currency renminbi in order to facilitate settlements by companies involved in China or CPEC related business. Identifying the myriad lucrative opportunities offered by the CPEC, also a pilot project under the China-proposed Belt and Road initiative, Standard Chartered also formed a "Belt & Road" Strategy Execution team to help facilitate its business in countries covered by the initiative. "More than 60 percent of Standard Chartered's global markets across Africa, Asia and the Middle East stand to benefit from China's 'Belt & Road' initiative," said a recent press release by the bank in Karachi. Pakistan's economy is set to grow by a robust 5.4 percent by 2018 as Chinese investment from a multi-billion dollar infrastructure project flows into the country, the World Bank predicted in a new report Thursday. The cash-strapped country, for years plagued by a bloody homegrown Taliban insurgency, has been battling to get its shaky economy back on track and solve a chronic energy crisis that cripples its industry. But now confidence in South Asia's second-biggest economy is growing, with security improving and the International Monetary Fund claiming in October that it has emerged from economic crisis after completing a bailout programme, though it still faces major challenges. Pakistan recorded a 4.7 percent growth in gross domestic product (GDP) for the fiscal year ended June 2016, the highest rate in eight years, and Prime Minister Nawaz Sharif has set an ambitious target of 5.7 percent for the current year. He is banking on structural reforms, the improved energy sector, taxation -- and China's ambitious $46 billion infrastructure project, the China-Pakistan Economic Corridor (CPEC), linking its western province of Xinjiang to the Arabian Sea via Pakistan. The World Bank report appeared optimistic about his plans, predicting even further growth in 2018. "The pace of Pakistan's economic growth will accelerate to 5.4 percent in fiscal 2018," the Bank report said, observing that a moderate increase in investment mainly related to CPEC projects is expected to contribute to an acceleration of growth. The Bank also noted Pakistan's efforts to address grinding poverty, including with revised ways to measure it. "Based on the revised poverty line..., the percentage of people living below the poverty line decreased from 64.3 percent in 2002 to 29.5 percent in 2014," the report said. Illango Patchamutu, World Bank country director for Pakistan, said the country needs to push forward with deeper structural reforms, and that the World Bank stood ready to support such an agenda. India’s celebrated position as the world’s fastest-growing large economy conceals a dangerous weakness: Too few people seem to want to invest in the country. Even going by the government’s growth figures, private investment is shrinking at an increasing pace -- by 1.9 percent between January and March, and by 3.1 percent between April and June. The government is struggling to make up for this lack of confidence with its own money. Recent reports suggest officials may seek parliamentary approval for $7.5 billion of additional spending over the next five months, which they hope will increase growth by 0.4 percentage points. The strategy isn't new. When he entered office, Prime Minister Narendra Modi confronted a slowdown in private investment that had brought India’s growth down from near double digits in 2010 to around 5 to 6 percent in 2014. He and his economic team decided then that public spending was the answer. They hoped that boosting government expenditure would “crowd in” private investment -- that it would raise investors’ spirits, fuel optimism and lead to major private-sector activity on the ground. But that’s simply not happened. And it’s worrying that, with half its term gone, the government seems unable or unwilling to admit that its approach isn't working. There are two reasons for India's dangerous investment gap. First, the financial pipeline for new investment is broken. In India, funding for new projects tends to come from the banking sector, which is dominated by state-controlled banks. Unfortunately, state banks are struggling with their balance sheets. They’ve got a large number of bad debts to clean up; while many have been accounted for in the last couple years, more will no doubt emerge. The result, of course, is that credit growth has been anemic. As a matter of fact, bank lending to industry actually contracted in August for the first time in a decade. The government has done too little to fix the pipeline. There’s only one real solution: to reduce the economy’s dependence on public sector banks, which are so vulnerable to manipulation by influential tycoons. Instead, officials have not only taken the idea of privatizing these banks off the table, but are now promising to be more “pragmatic” -- read: more lenient -- about forcing them to clean up their books. Second, investors have been burned too often in the past by arbitrary government decisions; disputes over taxation or environmental regulations have stopped work on many projects. Infrastructure investment in particular continues to be held up -- about half of India’s large projects are delayed -- tying up capital and leading to big losses for investors. Ambit Capital, a respected Mumbai-based equity research firm, has officially estimated that the demonetisation-driven cash crunch will result in GDP growth crashing to 0.5% in the second half of financial year 2016-17. This means the GDP growth for six months, from October 2016 to March 2017, could decelerate to 0.5%, down from 6.4% in the previous six months. Further, Ambit Capital estimates that during the October to December quarter that we are currently in, the GDP growth may contract, thus showing negative growth. However, Ambit is hopeful that a strong formalisation of the informal economy will ensue through 2017 until 2019 and this disruption could also crimp GDP growth in 2017-18 to 5.8 % from their earlier estimate of 7.3%. “The demonetisation-driven cash crunch that is playing out in India will paralyse economic activity in the short term. We expect a strong ‘formalisation effect’ to play out as nearly half of the non-tax paying businesses in the informal sector (40% share in GDP) will become unviable and cede market share to their organised sector counterparts. We expect this dynamic to crimp GDP growth in India in FY18 as well and hence we have cut our FY18 GDP growth estimate to 5.8 per cent YoY (from 7.3 per cent),” Ambit economists Ritika Mankar Mukherjee, Sumit Shekhar and Prashant Mittal said in a note. Pakistan is a frontier market economy, while India and China are emerging market economies. This means that Pakistan’s economy is less exposed to the global economy than India and China. Thus, it is less vulnerable to interest rate fluctuations in developed countries, most notably in the US. Then there’s the pouring in of Chinese investment, which is turning Pakistan into Beijing’s corridor to Middle East oil and to Africa’s riches. Add to that a couple of overseas endorsements for Pakistan’s market reforms from overseas institutions that have been hyping investor expectations. Like $1 billion in support from the World Bank – and a couple of domestic acquisitions from foreign suitors like the acquisition of Karachi’s K-Karachi by Shanghai Electric Power Co. While Pakistan’s market has been getting praise from overseas institutions and investors, India’s markets have been rattled by Modi’s experimentations with the country’s currency, as I wrote in a previous piece here. And China’s markets have been unsettled by the return of heavy-handed government policies, which have scared away foreign investors. To be fair, frontier markets are highly volatile, with one year’s big winners turning into next year’s big losers. Besides, with a big run up over the last five years, the big gains are already behind, for now. Investors should be very careful in establishing new positions at this time. KARACHI: Bulls dominated the Pakistan Stock Exchange on Tuesday as the market crossed another psychological landmark. The main index jumped past the 44,000 level after having crossed the 43,000 on November 14, 2016. The market traded neutral to developments of the Panama case. The benchmark KSE 100 index rallied up to record a new highest high of 44,236.89 with appreciation of 496.92 points. The index ended at 44,231.10, up by 491.13points, levels not touched ever before. The KMI 30 index ballooned higher by 1115.77 points to 74,785.76. The KSE All Share index also surged 309.55 points to close the session at 30,522.54. The advancer to decliner ratio stood at 217 to 175. The market volumes edged up from previous session’s 345.47 million to 372.59 million. K-Electric Limited (KEL +1.84%) turned out to be volume leader, volume of 22.80 million, for the day after the Competition Commission of Pakistan (CCP) gave clearance to its acquisition. Many cement stocks featured in the list of top traded scripts but the commercial bank sector again reported top cumulative volume of 59.85 million. The cement sector followed with total of 56.94 million shares traded. The cement sector was star performer for the day after All Pakistan Cement Manufacturers Association (APCMA) released data for the month of November 2016. The industry achieved its highest capacity utilization of 98.61% and recorded sales of 3.749 million tonnes against 3.377 million tonnes in the same month last year. Local demand expanded from 2.843 million tonnes to 3.270 million tonnes in the same month last year while exports continued to contract, down 10.39%. According to spokesperson of APCMA, exports are expected to remain under pressure as Afghan market is penetrated by Iran and export by sea is on the decline whereas exports to India have a positive trend. However, he was confident that growth in local demand would nullify this impact. Eleven of seventeen scripts traded gained around 5%, including Attock Cement (Pakistan) Limited (ACPL +4.97%), D G Khan Cement Company Limited (DGKC +4.89%), Maple Leaf Cement Factory Limited (MLCF +4.99%) and Fauji Cement Company Limited (FCCL +4.98%). On November 8th, 2016 Indian Prime Minister Narendra Modi announced a ban on currency notes of Rs. 500 and Rs 1,000 as a measure against black money. Everyone is affected in the short term. Markets seem to be in a free fall. Understanding the Indian economic set up will help you to understand should you buy or sell in this period. The event: A ban on currency notes of Rs 500 and Rs 1,000. November 8th 2016 - the day when the entire world including India was glued to their television sets trying to follow the US elections and the media was busy analyzing the impact of a Trump or a Clinton win on the entire world economy as a whole, Indian Prime Minister Narendra Modi during his address to the nation, very calmly announced that with (almost) immediate effect the currency notes of Rs. 500 and Rs. 1,000 will be banned from the country. They will cease to be legal tender and would now be worthless pieces of paper. These will eventually be replaced with new currency notes of Rs. 500 and Rs. 2,000 denomination. However, people who were holding on to the old physical currency notes will be able to exchange them in the banks for new notes until December 31st 2016. This was an extremely bold step taken by the Prime Minister towards curbing black money. This news sent ripples of shock waves throughout the country. People were not sure how would they be able to carry on with their day to day activities from the next day onwards. As a combined effect of demonetization and US presidential election, stock market indices dropped to an around six-month low in the week following the announcement. The day after the demonetization announcement, BSE SENSEX crashed nearly 1,689 points and NIFTY 50 plunged by over 541 points. By the end of the intraday trading section on 15 November 2016, the BSE SENSEX index was lower by 565 points and the NIFTY 50 index was below 8100 intraday. Foreign Institutional Investors (FIIs) and foreign portfolio investors (FPIs) have sold equity shares of around $1.4 billion in the past six trading days after the government demonetized Rs 500 and Rs 1000 currency notes. Although it is too early to quantify the impact of demonetization, analysts are predicting that there could be a short term pain for India's growth trajectory, but the country will witness long term positive effects. Several analysts are predicting a full fiscal year Gross Domestic Product (GDP) to be lower somewhere between 0.7 to 3 percentage points. What be the actual impact will be dependent to a large extent on how fast can the government replace the currency in circulation. But nonetheless there will be some time before small and medium businesses including their suppliers and customers adapt to demonetization. They are bound to see a fall in revenue and growth in the next 1 -2 quarters. Large scale organized businesses will be quicker to adapt to these changes. KARACHI: Asia’s best-performing market, the Pakistan Stock Exchange (PSX), is expected to see seven to eight new company listings in 2017 through the issuance of shares to general public in initial public offerings. “The companies that will make the initial public offering (IPO) will be from sectors like packaging, transportation, real estate investment trust, insurance and auto vendors,” said Shahid Ali Habib, Chief Executive Officer of Arif Habib Limited. “At least four of the expected IPOs are in our hands; these are expected to be launched by June 2017; we cannot disclose their names according to regulations,” he said. In addition to this, the government is also in the process of getting State Life Insurance Corporation (SLIC) listed on the stock exchange. The making and breaking of records at the PSX suggested that more companies would come to the exchange to raise interest-free funds in IPOs in a bid to develop new projects or expand their ongoing businesses, he said. In the current calendar year, three new companies were listed on the PSX. Two of them were Hi-Tech Lubricants and Loads Limited. In the year to date, the market’s benchmark KSE 100-share Index has advanced by over 40% to 46,584.53 points. Habib anticipated that a lot of positive happenings in the economy would support the benchmark index advance to 55,500 points by the end of December 2017. “Pakistan’s equity market will potentially generate a yield in the range of 17% to 21% in 2017,” he said. The bourse will continue to record strong returns in CY17, an assessment supported by the brokerage house Arif Habib’s price-to-earnings ratio (PER) re-rating hypothesis. “Currently, the market is trading at a CY17F PER of 9.1x (multiples), a discount of 22% and 34% to the MSCI Emerging Market and Asia-Pacific region, respectively,” he said and expected the equity market to go up to 9.7x in 2017. Factors supporting the upward trend include reclassification of Pakistan into the MSCI Emerging Market from the MSCI Frontier Market, double-digit earnings growth for listed companies (16.5%), attractive valuations, a strategic foreign investor acquiring a big stake in PSX and flush of liquidity from divestment to brokers (in the range of $90-100 million), continuing economic growth (5.1% in FY17), Chinese investment in Pakistan’s energy and infrastructure worth $55 billion by FY17-18 and political maturity. According to Habib, brokers are expected to re-invest the $90-100 million in equities, which will provide additional support to the market. He said the low interest rate scenario had created huge liquidity in the system and a big part of it was expected to land in the share market. Local investors have so far invested $450 million in the market. The trend is expected to continue in 2017. Habib said foreign investors had so far sold stocks worth $230 million at the PSX in 2016, as fund managers in the MSCI Frontier Market were pulling out ahead of Pakistan’s upgrading to the MSCI Emerging Market in May 2017. They are expected to return after Pakistan’s reclassification. He anticipated that foreigners would invest in the range of $300-400 million in 2017 against selling in 2016. At present, foreigners are holding shares worth $6.5-7 billion at the PSX. Pakistan’s benchmark KSE 100-stock index was on track to become the biggest gainer this year, with a 45.3% surge after its inclusion in the MSCI Emerging Markets Index in June. Asia’s equity markets ended 2016 slightly higher, despite a number of unexpected global events that had threatened to throw markets into disarray. With China the main exception, major Asian stock markets rose for the year. Australia’s S&P/ASX 200 rose 7%, while both Japan’s Nikkei Stock Average and Hong Kong’s Hang Seng Index added 0.4%. Singapore’s Straits Times Index rose 0.2% for the year. Among smaller markets, particularly those in Southeast Asia, performance was more mixed, with benchmark indexes in Malaysia, Vietnam and the Philippines ending the year in the red. Thailand’s benchmark SET 50 index was an outperformer, with the index on track to gain 18.6% for the year, even as investor buying interest paused after the death of the country’s long-reigning monarch in October. “We are seeing a Goldilocks scenario in global markets,” said Khiem Do, head of Asian multiasset investments at Baring Asset Management. Corporate earnings have been picking up, prompting investments, he said. In addition, Mr. Do said that toward the second half of the year, investments in fixed-income assets started moving to equities, helping global markets. Still, there were a number of global surprises that affected Asia’s equity markets, including the Brexit vote in June and Donald Trump’s victory in the U.S. presidential election in November. Even more surprising, analysts say, was the stock-market rally that followed Mr. Trump’s win. That was opposite earlier expectations of what would happen in the event of a Trump win, said Andrew Sullivan, managing director of sales trading at Haitong International Securities. Meanwhile, the Shanghai Composite Index tanked 12.3% for the year, as regulators there cracked down on leveraged purchases of stocks by insurance companies and as the yuan fell about 6.5% against the U.S. dollar for the year. To be sure, China’s declines could have been much steeper. In January, the Shanghai index plunged as much as 25%, as a circuit-breaker mechanism for the stock market, introduced to reduce volatility, set off a global market panic, forcing authorities to shelve the system. Malaysia’s Bursa index ended down 3.7% for the year, suffering from the controversy surrounding the Malaysian state investment fund known as 1MDB. Though not considered one of Asia’s main markets, Pakistan’s benchmark KSE 100-stock index was on track to become the biggest gainer this year, with a 45.3% surge after its inclusion in the MSCI Emerging Markets Index in June. However, on Friday, the last trading session of 2016, a weaker dollar early in the day sent local currencies higher, hurting the competitiveness of exports in the region. The greenback later recovered to trade 0.4% higher compared with the yen. But that wasn’t enough to stave off the decline in export stocks such as Honda Motor, which dropped 0.8%; Nissan, which ended down 0.4%; and Sony, which fell 0.7%. Toshiba, however, gained 9.4%, after analysts pointed out that the stock was oversold on worries of rising expenses at its U.S. nuclear-power unit. Overnight in the U.S., crude-oil prices fell after crude stockpiles there rose unexpectedly. In Asian trade, prices recovered slightly to trade at $57.08 a barrel. Among energy stocks in the region on Friday, Japan Petroleum lost 1.6%, and Inpex Corp. fell 0.8%. In Australia, Woodside Petroleum dropped 1.8%, contributing to the 0.6% decline in the benchmark S&P/ASX 200. In currencies, the euro briefly jumped on Friday against the U.S. dollar in thin Asian trade. The currency pair rose above $1.0700, its highest level in two weeks, from around $1.0490 in a matter of moments. The State Bank of Pakistan (SBP) on Friday released its first quarterly report on the economy of Pakistan. According to the report, SBP has projected growth in the manufacturing sector in the remaining part of the fiscal year due to supporting policies and encouraging outlook. A good response is expected from the automobile, sugar, pharmaceuticals and construction sectors. The report states that fiscal deficit rose because of lower than expected tax collection in the first quarter. SBP expects fiscal deficit to rise to 5 per cent of GDP in FY17 as against the target of 3.8 per cent. SBP is also expecting export targets for FY17 to be missed by $2.2 billion from the target of $24.7 billion. The GDP growth rate is projected to be between 5 to 6 per cent in FY17 against the target of 5.7 per cent. Remittances will also remain stagnant in FY17 around last year’s level of $20.5 billion. According to SBP, inflation will range between 4.5 per cent to 5.5 per cent in FY17 against the target of 6 per cent.